Donovan Peoples-Jones has seven touchdowns among his 30 catches for 447 yards. 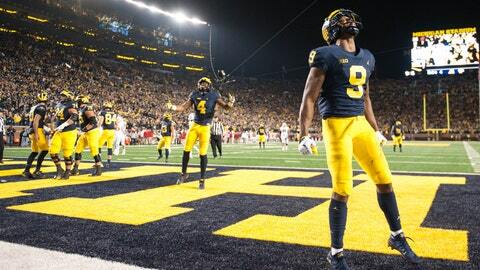 ANN ARBOR, Mich. (AP) — One season after Michigan’s wide receivers could not get in the end zone, coach Jim Harbaugh had just one complaint about the Wolverines’ pass catchers on Saturday. The guy with the black-rimmed glasses and khakis couldn’t haul them in. Michigan’s receivers battled windy conditions in a 42-7 win at Rutgers, the ninth straight for the fourth-ranked Wolverines (9-1, 7-0, No. 4 CFP). One reason for the team’s sustained run of success has been the production by quarterback Shea Patterson’s targets on the outside. Leading the way again Saturday was sophomore Donovan Peoples-Jones, who is fulfilling the five-star promise he brought to campus last season. Peoples-Jones arrived last season from Cass Tech, a Detroit powerhouse, catching 22 passes as a freshman for 277 yards and no receiving touchdowns. This season, he’s caught seven touchdowns among his 30 grabs for 447 yards. His touchdown on Sept. 8 against Western Michigan broke a run of 364 days without a TD catch from a Michigan wide receiver. A week later, against SMU, he caught three scores, helping ease the burden for the group and new wide receivers coach Jim McElwain, the former Florida head coach. Making matters easier is stability at quarterback. Patterson, a transfer from Ole Miss, has thrown 17 touchdowns and three interceptions, hitting seven different receivers for scores. The Wolverines host Indiana (5-5, 2-5) on Saturday for senior day before the Nov. 24 test at No. 9 Ohio State, winners of 13 of the last 14 against its rivals to the north. One player who has not caught any touchdowns — or passes at all — this season is sophomore Tarik Black, who is still working his way back from a broken right foot. Last season, Black lined up opposite Peoples-Jones, and the true freshman looked to be gaining steam early in the year with Black as the team’s leading receiver. Then, Black suffered a broken left foot in the third game and didn’t return. This year, the injury to the other foot occurred in the week leading up to the opener at Notre Dame, Michigan’s only loss. Black saw his first action this season on Oct. 20 against Michigan State and has played sporadically since then. Harbaugh said he continues to progress. His return could give Patterson another late-season weapon as the team tries to earn a spot in the College Football Playoff. The receiver group also includes sophomore Nico Collins, who has 26 catches and four touchdowns. Tight end Zach Gentry has 28 catches for 392 yards and two touchdowns. Peoples-Jones also has been showing some bravado, mimicking former Penn State running back Saquon Barkley’s touchdown celebration after scoring against the Nittany Lions.